We've looked far and wide for a portable battery pack that we felt was good enough to carry in our boats, trucks, cars, tractors, and everything else we drive. 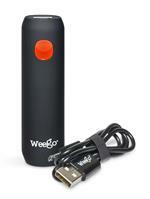 We feel confident that these WeeGo models will start and re-charge anything that goes dead on you. For those looking for a pack to throw under the back seat of the car or truck, the Heavy Duty JS-12 will be perfect. For those wanting the Ultimate package to start even your OptiMax engine on a cold morning, the Professional JS-18 will have your back. Both packs come with extension cables and fittings to work with virtually any portable electrical device that needs a charge. For a Limited Time - get a Tour 2600 Rechargable Battery Pack, regularly $24.95, for FREE with the purchase of either WeeGo Jump Starter!! So affordable – it pays for itself after just 1 jump!